We knew love could make you barf, but we didn’t chucking in the parking lot would do much for igniting new love. St. Louis, you amaze us once again! Well done. It this man’s world, there’s no time for punctuation, “no” = “know”, and catching one a drunk girl’s glazed over glances while she’s busy reverse eating her drunken Courtesy Diner meal at 3am is the start of a beautiful relationship. The problem of course, and the problem inherit with all “missed connections”, is how do you know if they are talking about you? There are two Courtesy Diners after all, and there’s little doubt at least two drunk girls simultaneously barfed in their respective parking lots with the most lady-like of grace. So what do you do if you’re one of these girls and wants to get a hold of this gentleman? 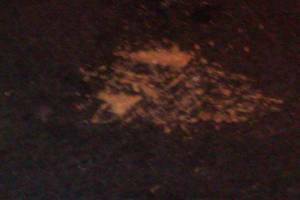 Lucky for you your future husband is a genius who took a picture of the barf so you can use your perfect memory of the night to look back and visually identify your puke pattern! It’s not quite a glass slipper, but this splotchy puke stain is going to make someone very very happy for the rest of their life… especially if he sends that puke to a DNA lab and manages to find out where she lives.